* Ready to make a sparkling statement? * Measuring 1 1/4" h x 1/2" w, these exclusive-to-Mariell earrings feature a stunning cushion cut center stone surrounded by pave CZs. * Guaranteed to add just the right amount of vintage glamour to any wedding or prom! * These regal 14K gold earrings are a must-have addition to every bridal stockist or retailer's wholesale jewellery display. * Featuring a cushion cut cubic zirconia stone surrounded by pave crystals, these earrings look like genuine fine diamond jewellery. 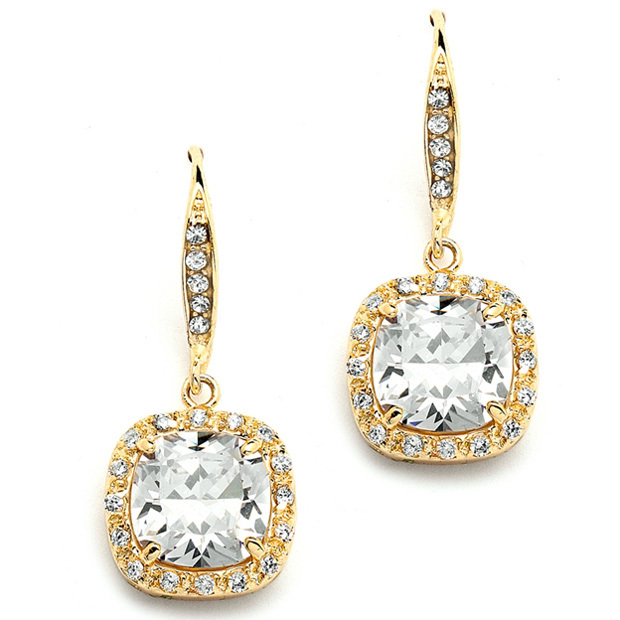 * They'll give a touch of 5th Avenue elegance to any wedding, graduation or mother of the bride!